Members of The Church of Jesus Christ of Latter-day Saints center their spiritual beliefs on the life, atonement, and resurrection of Jesus Christ. For this reason, Christmas is considered a very special time of year. In addition to services at each individual ward, which is similar to a congregation, the Mormon church's highest level of leadership broadcast a special devotional message to congregations and homes around the world. This devotional features a performance by the Mormon Tabernacle Choir, in addition to messages from the President of the church and his two counselors. The devotionals are archived online for the public to view at their leisure. The Book of Mormon serves as a second witness, with the first being the Biblical Gospels, that Jesus, born to a virgin, is the Son of God. 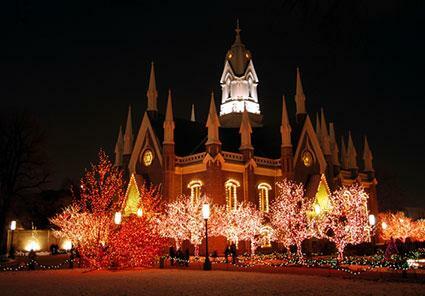 A Mormon Christmas service involves reciting the Christmas story from the Gospels in the Bible as well as the account from the Book of Mormon. 3 Nephi 1:9-21 tells the Christmas story from Nephi's perspective. Luke 2:1-20 is the traditional Gospel version of the Christmas story that is used by all members of Christian churches. Matthew 2:1-12 describes what happened after Jesus was born in Bethlehem. 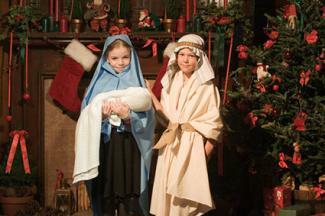 It's common for an LDS Christmas celebration to include a nativity scene as a decoration or a live reenactment using real animals and members of the ward to portray the different roles. Some stacks may also hold a Christmas nativity activity that invites members of the community to display their nativity sets in a central location. Everyone is then invited to tour the display, enjoy light refreshments, and visit with each other in the spirit of the season. LDS churches engage in many projects to the help the less fortunate throughout the year, but these efforts are taken up a notch during the Christmas season. It's common for a local ward to decorate a tree with tags that list items that can be purchased to benefit the less fortunate. The tags might list toys for children, food items such as a fruit basket or homemade cookies, or necessities such as a winter coat and new shoes. Members of the ward are encouraged to purchase the items and return them for wrapping and distribution before the holiday. Service projects are also popular during the Christmas season. Mormon families might sing Christmas carols at a local hospital, help an elderly neighbor with yard work or necessary household repairs, run errands for someone who is too ill to leave their home, or volunteer with a worthy nonprofit group in the community. 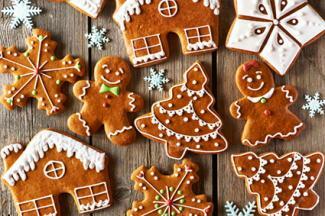 Rachel Bruner, the About.com Latter-day Saints expert, reports that she once lived in a stake, or group of several wards, with a tradition of baking an assortment of Christmas cookies to take to a local prison so those who were incarcerated would have a small gift for the holidays. 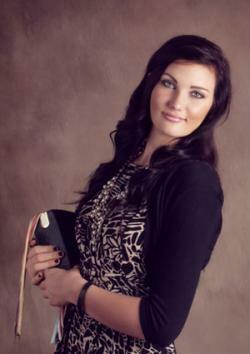 In the Mormon faith, adult women belong to Relief Society. This women's organization meets every Sunday and focuses on encouraging women to support each other as well as members of the community. During the Christmas season, it's common for Relief Societies to have an event where members make crafts, bake cookies, and read scriptures together. Your Home Based Mom has a blog post showcasing a Christmas Relief Society event with the theme "Why Christmas Trees Are Not Perfect" which provides an informative look at what happens during this type of Mormon Christmas celebration. A ward Christmas party and dinner typically involves all members of the church and their families. They gather together to hear a Christmas worship message, sing Christmas carols, and present small gifts to the children. The Christmas dinner traditionally includes turkey or ham, mashed potatoes, stuffing, vegetables, rolls, and assorted desserts. There is no coffee, tea, or alcohol served, however, as the Mormon faith does not permit the consumption of these beverages. Write letters to the Savior and place them in sealed envelopes under the tree as a gift to Him. Share the scripture by writing testimonies in copies of the Book of Mormon and sending them to friends or family members as gifts. Enjoy homemade cookies while taking turns reading the words of the prophets from the scriptures regarding the Savior's birth. Sing Christmas carols throughout the community or go perform for people in hospitals, retirement homes, and other locations that need a little extra Christmas cheer. Deliver Yule logs or other small gifts to the sick, elderly, or families experiencing financial difficulty. Although some Christian groups do not celebrate Christmas, the celebration of Jesus's birth is a significant part of the Mormon faith. During the month of December, members of The Church of Jesus Christ of Latter-day Saints gather together to celebrate their faith while giving back to the community at large.